Abstract: Samsung's latest CD burner in the SW series is capable of writing CD-R media at 32X, rewriting CD-RW media at 10X, and reading standard CD-ROM's at 40X. With the growing acceptance, and more importantly , lower prices of CD-R/RW drives, the speed race is on yet again in the world of optical drives. 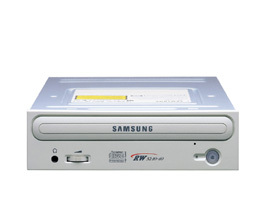 Samsung's latest CD burner in the SW series is capable of writing CD-R media at 32X, rewriting CD-RW media at 10X, and reading standard CD-ROM's at 40X. The aptly named SW-232 retails for about $75USD which is pretty good considering it has an 8MB buffer, comes bundled with Roxio's Easy CD Creator 5 and supports PureBurn / Justlink buffer underrun protection. The SW232 has 512KB of flash memory so the firmware can be updated in the future if necessary; the drive we tested was using firmware version R300. The SW232 writes using a P-CAV write type and features a quiet geared tray mechanism (as opposed to rubber belt). The CD-RW can be mounted horizontally or vertically depending on your preference and application. Both the full sized 120mm CD's and smaller half-size 80mm CD's can be read. The front bezel follows along with previous Samsung drives and uses a rounded tray cover for a clean and simple look. The only features on the front of the drive are the eject button, indication LED, headphone jack and volume wheel for audio disk playback. The rear of the drive features the standard assortment of connectors; IDE/Molex Power/Analog Audio and two-pin digital audio output terminal. The drive comes with an IDE cable, some screws, the bundled software, instructions and a four-pin analog audio cable. The Samsung SW232 CD-RW is bundled with a proprietory version of Roxio's Easy CD Creator 5 which is a very good burning app compared to Ahead's NERO BurningROM. The Samsung burner uses "Super Link," "Just Link" or something which is basically like BurnProof to protect against buffer underrun errors. In any case the, the large 8MB buffer also helps to ensure that as few errors as possible muck up the burn process. We made sure that the drive was set to DMA to get the best possible results from it. The e-TestingLabs CD Winbench99 benchmark runs a series of scripted programs from a special CD in the drive and measures the time and data transfer capabilities as a result. Higher numbers mean better performance. The SW-232 produces better results than the SW224, but still only middle of the road performance as a CDROM in the CDWinbench benchmark. This is somewhat expected from the drive as it is only a 40X CDROM.